Hi all!! Happy day to you!!! Today's share is a card that i made for a friend that has been a bit under the weather. I hope this will make her feel a bit better:) I tried a new technique that I learned awhile back where you heat emboss vellum. I LOVE the way that it looks. I am obsessed with yet another thing now, lol. I used the Secret Garden stamp set with the coordinating dies, a set that i haven't busted out in awhile since it has been winter here for what seems like eternity, lol. I did 2 different things to color in my flowers. On my larger flower i heat embossed my outline in the White Embossing Powder and then i colored them, from the back side of the flower, with my Wisteria Wonder Marker. 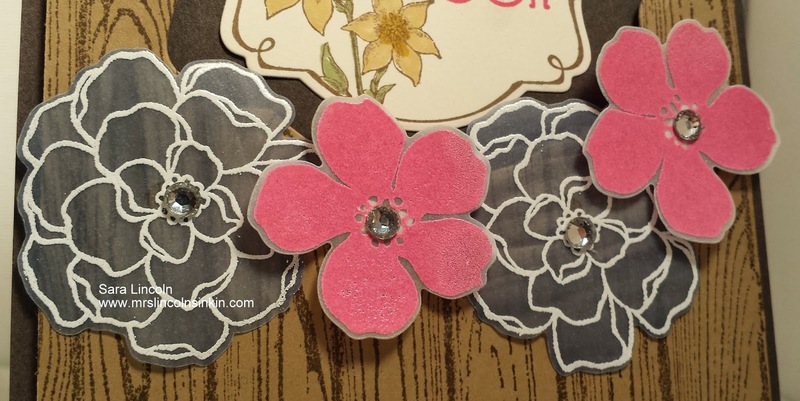 For my smaller flower, i heat embossed them both with my Melon Mambo Embossing Powder. My card is average size of 4 1/4" x 5 1/2" and is in Early Espresso, but it is what i call a double layer card. I call it this because my top layer, which on this card is the Soft Suede card stock and then i stamped it with my Hardwood stamp in the Brown Sugar ink, is puffed up with Dimensionals to give it a 3D look. For my greeting i chose to use my You're Lovely stamp set (from the SAB Brochure) and then added the "Get Well Soon" from the Delightful Dozen. The item that i am showcasing today is going to be the Secret Garden stamp set and Secret Garden Framelits. 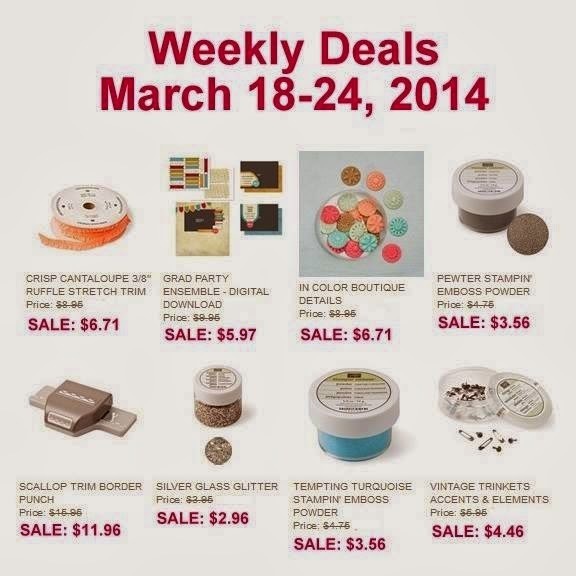 Now real quick here are the weekly deals for this week! 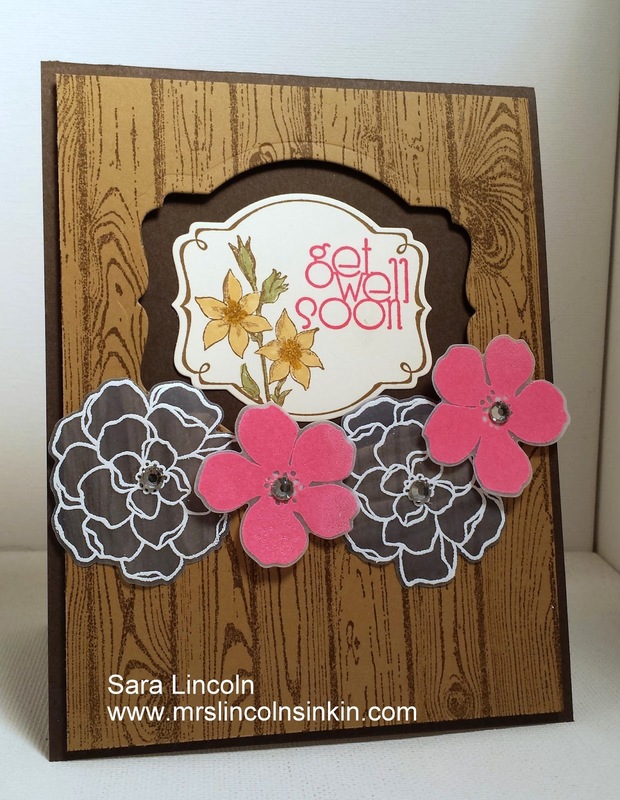 Ha, there are 2 embossing powders on the list this week, great day to share my card where i used some of them huh? What a neat card. Thanks for sharing our talents.